As the entire drum corps community looks ahead to the new year and the summer of 2010, this week, Drum Corps International recaps some of the highlights of 2009, today with the most viewed DCI.org headlines from the past year. Sunday, August 9, 2009: In a moment they will never forget, 150 drum corps members joined the ranks of those who can call themselves World Champions Saturday. With a score of 99.05, just a tenth of a point shy of the all-time record, the Blue Devils were named Drum Corps International's 2009 World Class World Champions after completing an entirely undefeated season. Their success mirrored that of their Open Class counterparts, Blue Devils B, who earned the gold medal in the Open Class Finals competition earlier in the day after their own perfect season. The optimism and excitement of "1930" shined through the Blue Devils' last performance, which earned them the right to proudly wear the Champion medals around their necks and call themselves the "best of the best" in marching music. Read this article in its entirety. 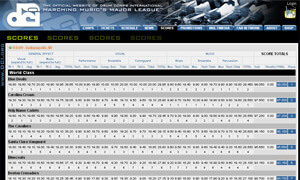 Sunday, August 9, 2009: The Blue Devils won their 13th DCI World Championship in convincing fashion by scoring 99.05, 0.65 higher than their score from the Semifinals. They were able to increase their spread over second place Carolina Crown to 1.55 from 0.85 at the Semifinals. Along the way, the corps won four of the five special caption awards that were determined by averaging the scores of Quarterfinals, Semifinals and Finals, losing only Brass Performance to Carolina Crown. Those four awards included Overall General Effect, Visual Performance, Color Guard and Percussion Performance. The only captions on the score sheets the corps didn't win were Brass and Music Ensemble, leading to a 0.10 deficit to Carolina Crown in total Music. The corps received a 19.95 for Music Effect, just 0.05 from a perfect score after both judges were combined. Visual Performance was in at 19.9 and both Visual Ensemble and Color Guard nailed perfect scores of 20.0 so that the total Visual score came in at 29.95. 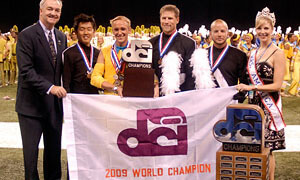 Wednesday, March 11, 2009: Over the last two weeks, more than 17,000 fans around the world logged onto DCI.org to select their six favorite corps performances amongst 72 World Championship Finalists from 2004-2008. 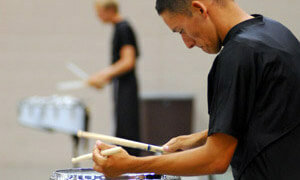 The first round of online voting narrowed the field to 12 finalist corps. During the second round, fans had the opportunity to select the six corps performances that will be shown up on the big screen when Drum Corps International's "The Countdown" comes to select theaters on Wednesday, May 13. Thursday, August 6, 2009: The Indiana Convention Center resonated Wednesday, Aug. 5, 2009 with the sights and sounds of drum corps. With more than 200 solo and ensemble performances scheduled over a span of six hours, corps members, family members and other fans were able to take in a wide variety of musical and visual presentations showing off the best talent DCI corps have to offer. In addition to the competition, the convention center was abuzz with other activities including the annual fastest drummer competition which drew cheers from the audience whenever a competitor threatened the record. Also right in the middle of the action, SportClips was on hand to give corps members a clean cut as they get set to take the stage in front of thousands of fans this week at the World Championships. 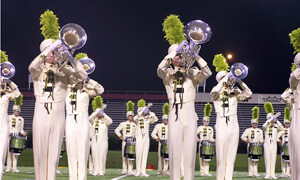 Friday, June 26, 2009: Carolina Crown emerged victorious at Friday's DCI Central Illinois event, earning a higher score than The Cavaliers for the first time in the corps' 20-year history. With a score of 77.50, Carolina Crown surpassed the Cavaliers' 77.10 by a few tenths of a point. Carolina Crown Program Coordinator Jim Coates said he was surprised with the night's outcome to some degree, but happy that their hard work and unique sound was recognized. "We have a great program, the design team put a fabulous program together, and the kids are really enjoying it. Certainly the crowd was right with them tonight and that pushed the kids to the emotional difference in here. I think it came through on the effect sheets and the effect scores, especially music," he said.